I'm not really sure what the deal is here in Dubai with recycling in Dubai. We have two wheelie bins outside the front gate a black one for general waste and a green one for recycling. The refuse collection comes every night around 9pm to empty the bin and re line it with a black bag. However they only empty the bin if it's full. The neighbours regularly add rubbish to our bins if theirs are full and it seems to be an acceptable thing to do. It's also perfectly normal to leave any unwanted larger items outside side your gate, such as furniture and other larger items. These are often taken by the maids and gardeners and when we left a door outside the hinges and handles were removed for scrap by one collector and then the door taken later that day by someone else. The gardener puts the grass and plant cuttings in either bin and our attempts at recycling tins, cans, paper and cardboard seem to be a pointless exercise as when the wheelie bins are collected they get thrown into the same lorry. People do however go through the recycling bins and recover cans and plastic bottles, I assume to sell on somewhere. We have a collection of newspapers and leaflets thrown over the gate daily. the local free newspaper 7 days is very informative and I recycle them by making pots for sewing seeds in. We no longer get the newspapers and have since moved house, but the number of leaflets hasn't decreased. We also use 2 large bottles of water every week for drinking and cooking in, the tap water is brown and warm. I am still trying to find an alternative use for them, let me know if you have any ideas. We could cut down a bit more with our recycling and although this looks like a lot of cold drinks in the fridge, that photo was taken after a food shop and will last 4-6 weeks when we don't have visitors and we do drink squash not just drinks from cans. We take our own bags to the supermarkets but unless you pay attention they still pack into the free plastic bags anyway, leaving me to empty them and leave them behind. 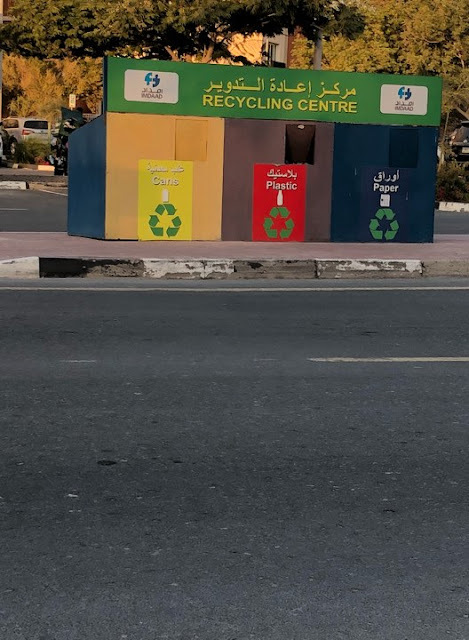 There are clothing banks, often outside the mosques and some shopping malls and centres have recycling bins for batteries, energy light bulbs and mobile phones. I'm also struggling to find places where I can drop unwanted goods off at and food that is nearing it's end date. It's not something we had an issue with in South Africa, everything was recycled and it was easy to do so. I guess this is just something I need to do a bit more research into. Since moving to our new house the other side of Dubai, we've only been issued with 1 green bin which is for general waste, but I have now found somewhere to recycle cans, papers and plastic at our local Carrefour where I shop every week and we I have cut down on the amount of sugary drinks I have and the tap water here is drinkable if not still a bit warm, so only using one of the large bottles every 2 weeks or so. It's been 7 years since we left the UK now and I still get cross at the lack of recycling and the amount of waste over here in Dubai. When I'm back in the UK, I have purple and pink bags for plastic and paper and a food bin that I use religiously. There's no way Im recycling food waste out here though, could you imagine the stench in the summer when temps reach 50c? I like the curb recycling of furniture and other unwanted objects. I do the same here in the US - I put a chair on the curb and it's gone within hours. One man's trash is another man's treasure. The approach to recycling is so inconsistent around the world. I remember my dad getting really annoyed when he saw all of their bins being emptied into one huge lorry. Thankfully that has changed now. At least with the can recycling at the supermarket is a step in the right direction. The issue is not only in Dubai, but all over the globe, I have lived in numerous countries. Currently I am in London, UK and I can freely say that now rubbish collection is far way better than some other places. Living with an empty nest. Spa day for Dogs in Dubai with Paw Parking. Poor Customer Service and getting results online.